You might remember this post, where I shared a bit from one of my visits to Linz again. During my journey I was introduced to the work of a local artisan that my sister had told me about. I was drawn to the designs especially because of the method used, so naturally I wanted to share about her collection along with an interview with the designer herself. Katrin Eckerstorfer, the Austrian jewellery designer behind the brand Häkelstorfer creates contemporary jewellery and accessories with an artful elegance. 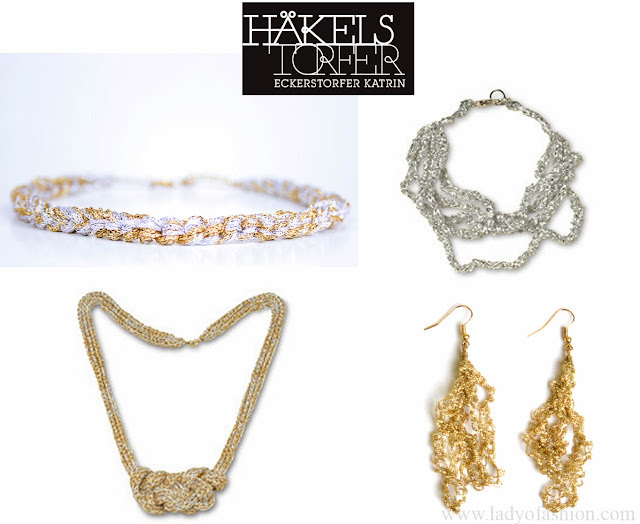 The Häkelstorfer brand offers a diverse range of accessories, including unique statement pieces and crochet-like designs with the aesthetic of mixed metals—primary materials used in the line consist of mostly gold and silver yarn, and antique crystals as well as glass, and stone. Eckerstorfer’s design technique has the visual of gold and silver chain, yet the pieces are made out of yarn. Häkelstorfer is significantly a play on words, and drafted from the designer’s surname and “Häkeln,” which means crochet in German. The Linz based designer is entirely self taught and will be working in an upcoming collaboration with acclaimed hair stylist, Mario Krankl. “I get inspired by the major fashion weeks and also from my travels around the world. Last summer I spent it in Thailand where I let myself be influenced from the culture,” Eckerstorfer stated. Who is the Häkelstorfer customer? The fashionable, hip, and “well-heeled lady,” Eckerstorfer said. 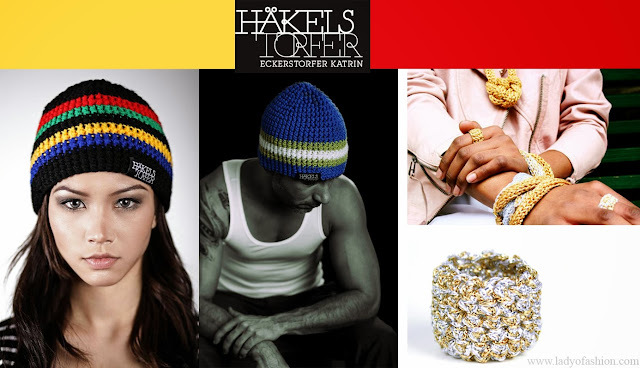 But, there’s even more to the collection than artsy necklaces and dazzling bracelets—Häkelstorfer also stocks one-of-a-kind pieces, and headwear accessories, including headbands, and knitted hats for all to enjoy. If you’re in the area make certain to check out the art and design market in Vienna, Feschmarkt from the 15th-17th of November. You can grab winter pieces from the Häkelstorfer collection along with other designers featured. Images: Courtesy of Katrin Eckerstorfer, edited via Ladyofashion. Any advice or words of wisdom for aspiring designers? Wowww these jewels are beyond gorgeous! I love them! Love the gold and silver intertwined pieces--truly unique gems! How unusual. These designs are so different and I especially like the crochet or knitted effect and the way two colours are used in one piece. I've always been a fan of wearing white gold (or silver) and yellow gold together. SO SO SO schöne Teile!! I always really enjoy the designers you choose to focus on, to introduce and to interview. What an intriguing - and beautiful - approach to the creation of the 'chains'. These jewellery looks beyond amazing. Love every single piece. I have never seen gehäkelte (I couldn't resist) jewellery before. Will check them out for sure. Have a happy Friday Madison!! This is a really great feature - the method is pretty fascinating and the pieces are very unique. The necklaces are amazing. I love how unique all of the designs are - gorgeous. My jaw dropped a little at the sight of these exquisite pieces, wow, truly stunning, Vienna must have been amazing! What beautiful - and unique - pieces! I always love learning about new jewelry lines; when it comes to clothing, my style is quite defined but with jewelry, I'll try anything once. I absolutely love the look of those hanging crystals that run down the model's back in the advertising photo - how stunning! Such a lovely items! Very beautiful! What lovely and artful creations! It's awesome how you discovered this fantastic line on your travels. Have a wonderful weekend Madison! WOW! I totally LOVE their line and their aesthetic! Gosh, that necklace in the first pic is beautiful! Her works are so lovely,Am loving every pieces of these jewels. Liebe Madison, diese Marke kannte ich bisher noch gar nicht, dabei ist die Firma in unserem Nachbarland! Mir gefallen die Sachen sehr gut, besonders die Mützen sind cool. Vielen Dank, dass Du die Marke hier zeigst, das ist ein guter Tipp <3 Hoffentlich ist Dein Wochenende schön! Liebe Madison. Was für schöne und ausgefallen Schmuckstücke, ganz besonders. They are so so beautiful. I love finding out more about designers from you. These pieces are beautiful. My favourite is the effect of the combination of gold and silver. Really beautiful pieces! I love that necklace and bracelet at the bottom. So gorgeous! :-) Yes, it is. And, glad that you were able to read the feature. Thanks Sam! Ahh, thanks so much, glad that you liked the feature. I always enjoy coming across emering talent. Thanks! Happy to introduce you to her work. Enjoy your week. Danke! Ja, absolut, das ist Marke ganz nah bei dir. :-) Es ist ein Vergnügen Sie zu diesem Schmuck und Designer vorstellen. Glad that you liked them too. Thanks Kim. This is such a great collection of jewelry designed by the great designer katrin Exkerstorter .Thanks for sharing such wonderful jewelry collection.I am very happy to see this unique collection of jewelry.